It’s not easy to retain the best features of a cannabis plant. Thankfully, there’s a proven method that you can use to produce big and healthy cannabis clones. The process is known as air layering. Propagating cannabis is a process that requires growing plants from a strong parent specimen. The air layering method is an especially effective way to propagate the plants, which often leads to better results. The most obvious advantage of air layering your cannabis plant is that the clone is guaranteed to copy all the traits of the mother plant. With this method of propagating plants, all the characteristics of the mother plant will be retained on the clone because the clone and the mother are one before the plant’s layered section starts producing roots and is replanted. Through air layering, you’ll be able to produce several clones at once. The clones are also guaranteed to grow some roots and have a good chance of surviving because they are still connected to the mother plant. Furthermore, the purity of the strain will be preserved and multiplying a single preferred strain will become way easier. Plastic wrap film (black or opaque colored). Rooting gel or cloning gel. The sharp knife hat is sterilized. Bread ties or rubber bands. Start by soaking the rooting block or moss. Squeeze it afterward in order to remove any excess water. Next, choose the branch of the plant that you want to clone. For the best results, choose a strong branch that has excellent vegetative growth. To make room for the rooting block or moss, remove some of the leaves. Mark the area of the branch where you intend to place the moss. Simply run the edge of your knife into the branch in a peeling motion. Slightly aim the blade down so it cuts through the branch but not totally breaking it off! Next, apply the cloning or rooting gel to the area of the plant that you have scored. Cover the scoured area of the plant with the moss block. Wrap the moss with plastic and tie off both ends with bread ties or rubber bands. 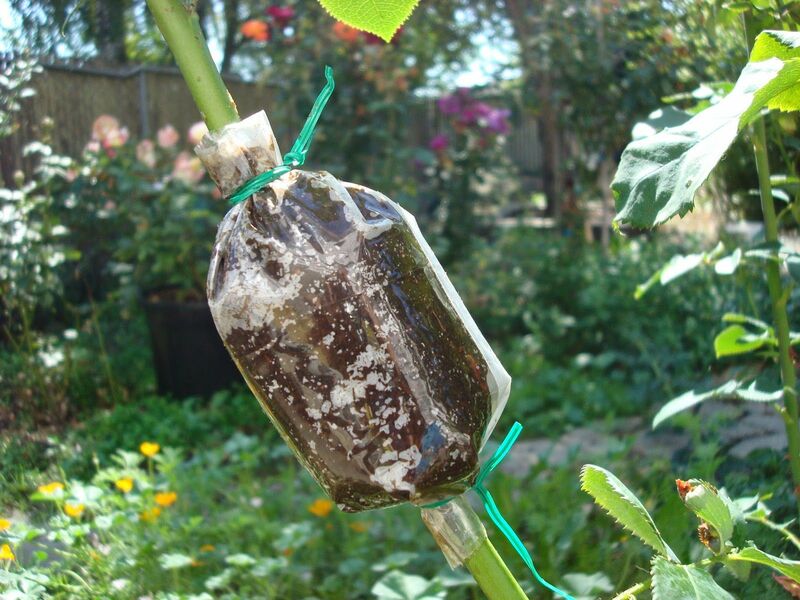 Make sure to create a seal that will trap the moisture around the branch and encourage it to produce roots. Leave the branch to sit in an air chamber while making sure to inspect it regularly for the presence of roots. As soon as the branch starts producing healthy roots, cut it from the parent stock and plant it in the same way as a regular plant. So as you can see, air layering your cannabis plant is very easy. The method comes with many benefits but the biggest advantage is that it allows you to preserve the genetics of the mother plant without causing any damage to the plant.